I have been getting a lot of love for my chicken preparations. Lots of likes, views and drools. 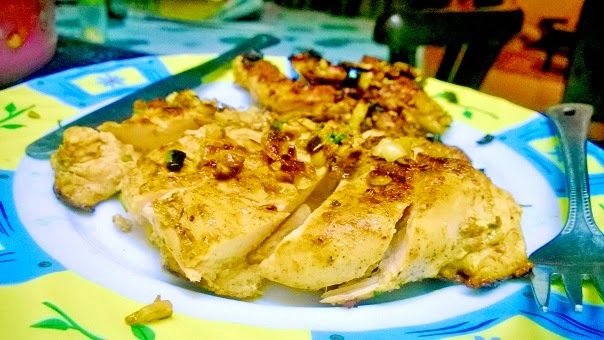 So, I thought of sharing this wonderful "Peanut Crusted Chicken Steak" recipe. The chicken steak for today is full of protein as it includes chicken, peanuts and little bit of egg and obviously it is full of flavor. Olive oil or refined oil to cook. 1-2 table spoons. First thing that you need to know when cooking whole chicken breast is that it needs to be pounded for even cooking. For this, put it on chopping board, cover it with cling film and lightly pound it with rolling pin or mallet to slightly flatten and even it out. Now season it nicely with salt and pepper and dried Thyme and Parsley. Heat olive oil in flat pan. Don't heat it too much. Olive oil has a moderate smoking point so if you heat it too much you will create toxic fumes. Good to know, isn't it? Check out smoking points of different cooking oils. Now sear the chicken breast on the pan on medium and cook on both sides for 5 minutes each. Now take it out, let it rest for about 2-3 minutes. Give it an egg wash and coat it with crushed peanuts. Cook it again on medium heat in pan for 3-4 minutes on each side. Ensure heat is medium to low else you will burn your peanuts. Take it out and splurge!!! When you are making this kind of dish in pan, it makes up for a healthy meal as you are using very less oil and obviously the ingredients matter too. Do show your love by subscribing to my blog via E-mail so that you keep receiving wonderful recipes.